PRI’s Middle East and North Africa office are organising two workshops this week on the juvenile criminal system in Egypt. The sessions are part of a project funded by the Dutch Ministry of Foreign Affairs. The training, carried out in cooperation with the Ministry of Justice, will focus on raising awareness of international standards and guidelines and promoting restorative justice for children and young people, and will target more than 50 senior managers, judges, prosecutors, police officers, and social workers. Civil society representatives will also participate in promoting alternative measures and sanctions for juveniles. This project is being implemented in three countries and aims to increase the number of juveniles diverted from the criminal justice system and ensure that fewer children receive criminal convictions. It also aims to reduce the number of young people held in detention facilities and overcrowding, and to build a specialised independent inspection body for juvenile facilities. PRI has already established a similar body in Jordan following an agreement with the Ministry of Social Development there. 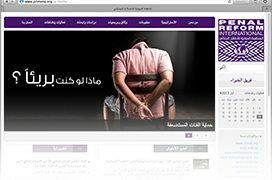 PRI is also preparing a training workshop for prison directors in Egypt in March as part of its project ‘Promoting a Human Rights based Approach towards Vulnerable Groups in Detention in the Middle East and North Africa region’.